Over 30 years of mechanical repair experience we will have you safely on the road again just as soon as possible. We repair diesels, tractor-trailers, automobiles, heavy equipment, buses and RVs. Our mechanic will diagnose and repair your vehicle if you have a break down. Our Service Truck will go to your home, work place or to a job site to make repairs. ​​Appointments are also available for preventative maintenance or fix a problem before you have a breakdown at your location or bring it to our shop located one mile south of town on Highway 69. Our service area covers a 50 mile radius from Cameron which includes north to the Iowa state line, south to Kansas City, west to St. Joseph and east to Chillicothe and surrounding communities. We also offer a Loyalty Discount to repeat customers, as well as Military Discounts and Senior Citizen Discounts off of the labor rate. 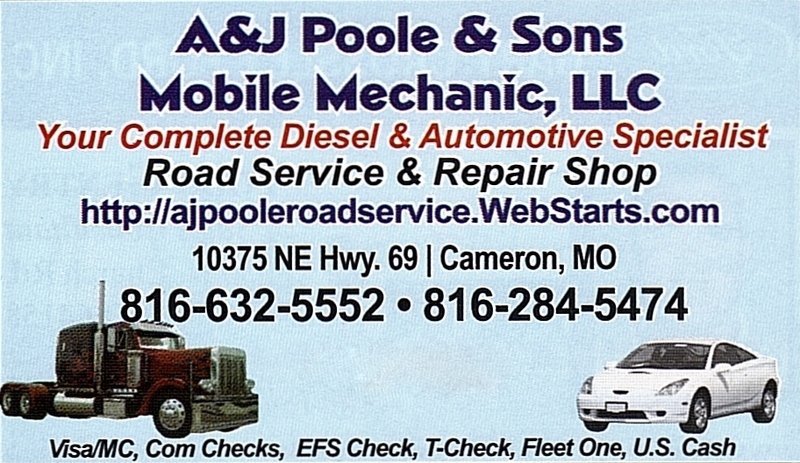 A&J Poole & Sons Mobile Mechanic, LLC is a family owned and operated company who puts safety first. We treat our customers like extended family. ​We provide local transportation for our customers to their homes or to work if needed. ​​We provide local transportation for the out of town drivers to motels or restaurants. "Your complete diesel and automotive repair specialist.​"
Our service is not in service at this time. ​we thank you for your patronage.